Cypress trees and their knees. If you have ever asked yourself the question, “Why do bald cypresses have knees?” then you are not alone. Cypress trees are unusual when compared to most other tree species, whose root systems run underground, because although cypress roots do run underground, some of their root structures also come back up. When this happens we get cypress knees, which are strange structures that grow at right angles to the ground, but that are found several feet away from the actual tree itself. In this sense, cypress knees appear as if they are completely separate plants, when in fact they are an integral part of the tree found at their center. While these cypress knees are fascinating to both scientists and tourists to the area, the definitive reason for their existence is still unknown. There are, however, two generally accepted theories in the scientific community. A pneumatophore is an exterior structure that aids in helping a tree to absorb oxygen from the air, much like a snorkel helps a swimmer to obtain oxygen while still remaining underwater. Since water levels often fluctuate so frequently in areas where cypress trees are found, this theory revolves around the idea that cypress trees need these structures in order to get their oxygen during times of flooding or unusually high water levels. Since this is what mangroves use their knees for, and because cypress trees and mangroves are often found in the same habitats, it would seem a likely assumption. However, doubts have been raised after recent studies have shown cypress knees to be quite ineffective at actually absorbing oxygen from the surrounding air. 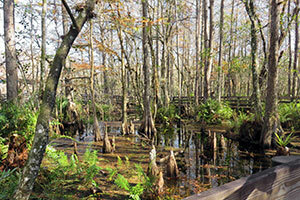 Many species of cypress trees are found in swamps and wetlands, areas where the soil can be moist, soggy, and relatively unstable, especially in areas that are prone to hurricanes and flooding, such as the Florida Everglades. Because some types of cypress trees grow very high and thin, this unstable soil could potentially cause them to fall over and die as their root system weakens. However, this doesn’t happen, and most cypress trees will remain standing tall and straight even when they appear to be hanging on by mere threads at their bases. This theory certainly seems like the more appropriate of the two, especially considering that the first theory has recently been somewhat disproved, but more research is necessary before any final conclusions can be drawn. While the answer to the question, “Why do bald cypresses have knees?” is still a mystery, scientists are getting closer to reaching a conclusion. To observe a few species of cypress trees right within their native swamps, take an airboat ride through the Everglades this summer. After viewing a plethora of Florida’s native plants and animals in the wild while on an airboat tour, not only will you have a greater appreciation of the bald cypress, but you may even be left with a few theories for yourself about those mysterious knees. Previous story Why Do Birds Sing?